In picture perfect Tulum, you will ride pastel coloured bikes, eat fresh seafood straight from the water in beachfront Tulum restaurants and drift into a relaxed trance – something only salty air and soft sand can do. 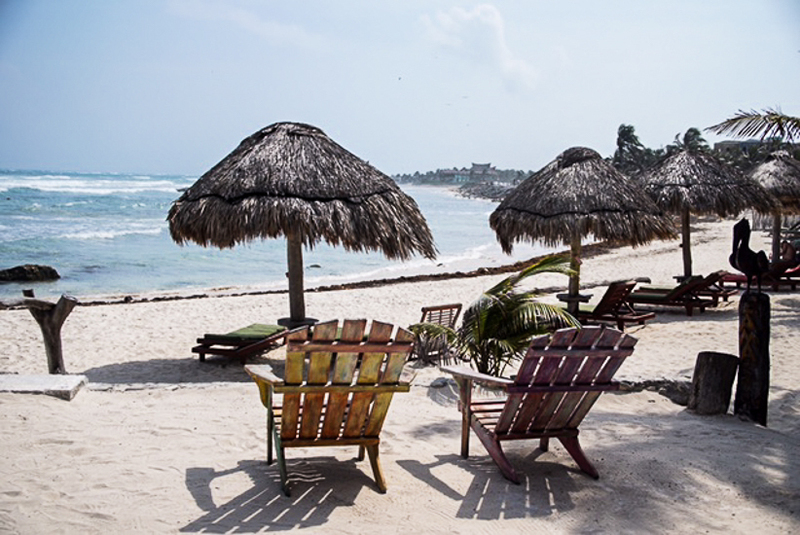 Once a sleepy beach town sans electricity and any real roads in or out, Tulum has managed to keep its laid back approach, but now its peppered with trendy eateries and beach bars, oh and the electricity is optional. 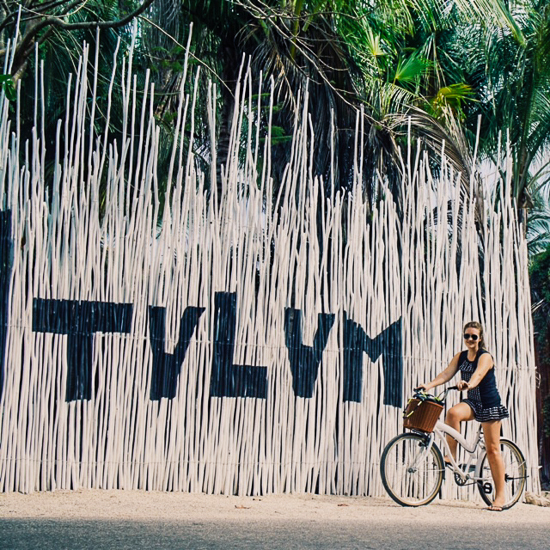 From yogi to beach bum and culinary connoisseur, Tulum is flourishing with options and it should be the next holiday you book. Cancun is the closest airport to fly into which is pretty popular with the young Spring Break kind of crowd. So if you know what’s good for you, you will get the heck out of there as fast as you can. A shuttle is the best way to get down to Tulum. It’s just two hours from Cancun. Renting a car at the airport can be an expensive ordeal as the exorbitant insurance is not optional. Between the many beach cruiser bikes and taxis, your own vehicle is not necessary unless you plan on exploring other areas on multiple days. I needed a little geography lesson for picking a place to stay. There are two parts of Tulum. Tulum City, a lively local town with lots of little souvenir shops and Tulum beach, where most of the restaurants and hotels are. When most people think of Tulum they are referring to the beach and to be honest can anything really beat living on the beach for a couple of days? We stayed at Zamas Hotel in a bungalow right on the beach. Eat as much fresh fish, guacamole and tacos as possible. Be sure to wash it down with a good strong margarita. I guess water in between is a good idea, because you know falling facedown in the sand from dehydration is never chic. Apart from being the hotel we stayed at, people come to Zamas for the food and stay for the live music. From all the places I tried, and trust me I tried a lot, the guacamole here is 10/10. The beauty of eating guac in Tulum is not only the freshness and the bold colour, but the fact I’m not paying $US14 dollars a spoonful makes it taste that much better. Before eating my weight in Mexican food in Tulum, I couldn’t quite grasp the concept of how it could possibly be that much better in Mexico. If you get the fajitas and ceviche from Mateos you will understand that sentiment. I had every intention of eating at Hartwood, so much so it was saved for our last special night in Tulum. However, Mother Nature had other plans and sent a torrential downpour our way just moments after we went to make a reservation. Hartwood knew what was coming and was closed for the night. We on the other hand, were drenched from the ride home on our bikes and Hart-less so to speak. Everyone I speak to recommends the seafood restaurant. My recommendation – just don’t wait ’til your last night to go. There is also a pretty epic waitlist for this place, so try to get there early. Located in Tulum town, don’t be fooled by the plastic chairs and pea gravel at La Coqueta. This hidden gem is what I imagine dinner would be like at abuela’s house. We ordered our standard ceviche, guacamole and margarita starter, which simply got us excited for more. Let’s just say after multiple tacos and fajitas we rolled home. Posada Margherita was another place we weren’t able to try. We did manage to order some cocktails, of course. There’s always room for cocktails. Known for its homemade pasta, I have heard nothing but rave reviews about the Italian dishes here. If you are willing to spend a day away from the beach, I highly recommend a day trip. About two hours away from Tulum beach in the Yucatan state are Chichén Itzá, Ik Kil Cenote and Valladolid, a small authentic Mexican town. 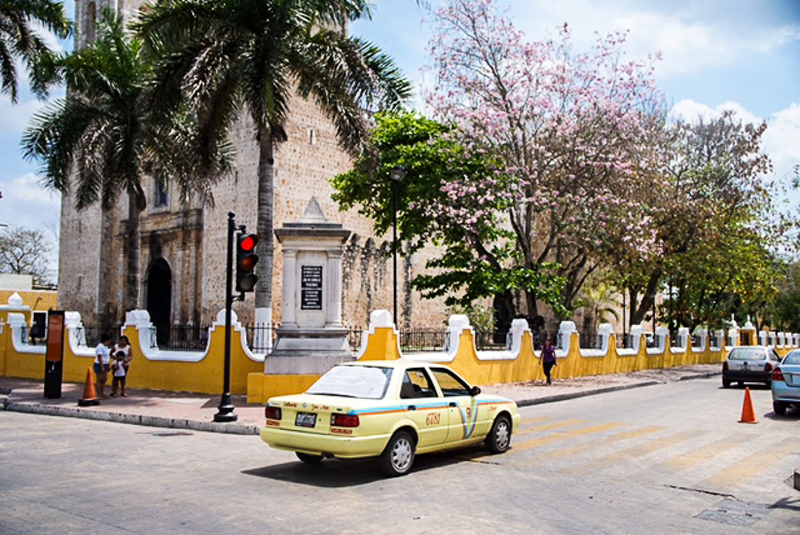 There are a couple of ways to get there such as tour group, public bus or private taxi. Normally one for a bargain, we went with the easiest option which also was happened to be the more expensive one, but it meant we got to see all the different places quickly and at our pace. Our hotel organised a private driver to pick us up at 6am, arriving at Chichen Itza by opening time at 8am. The beauty of a private car is that our driver waited at each place for us and then drove us home. 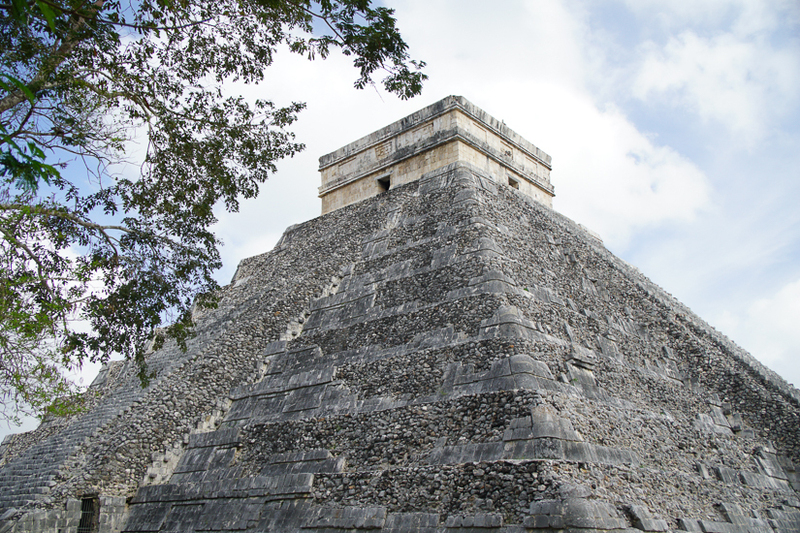 Not only did we see Chichen Itza, we stopped at Ik Kil, a mind-blowing sinkhole and Valladolid; the perfect place to get some authentic grub for lunch. The 52-cent street cart tacos are definitely something to call home about. 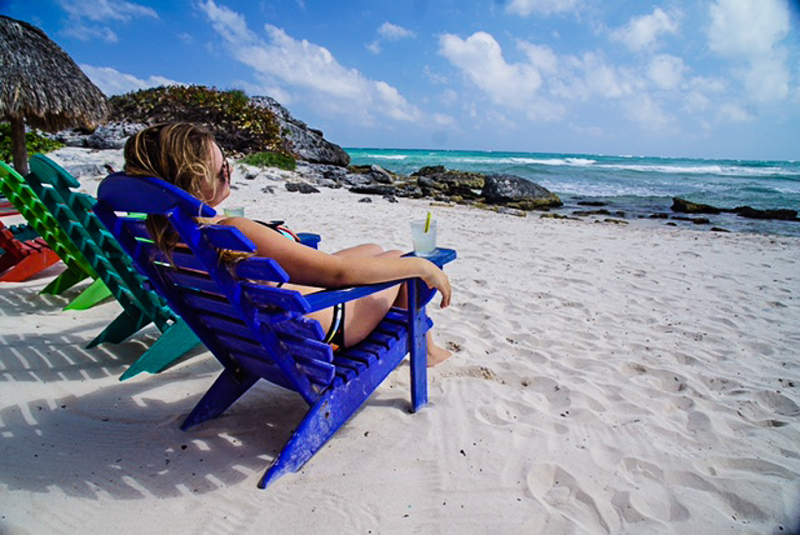 If devoting a whole day is not for you, the Tulum Ruins are a great alternative. Take a bike north for 20 minutes and you will hit the only Mayan Ruins on the water. The ruins are impressive alone, but perched on the edge of the turquoise water they are simply magical. If you don’t make the trip out to the Yucatan, there are a few cenotes only 20 minutes drive from Tulum Beach. Cenotes are naturally occurring sinkholes and underwater caves that now top bucket lists. The mineral rich water filters through the limestone leaving the water crystal clear. My best tip is to get early. You will likely have the whole place to yourself. Meaning ‘Two Eyes’ in Spanish, Dos Ojos is actually a flooded cave and arguably one of the most popular in the area. It’s great for those eager to scuba dive or snorkel to explore all the cave systems. Those who are not a huge fan of dark underwater cavities, I would suggest staying in the Cenote entry and practice your best mermaid pose. Often overlooked for its neighbouring Cenote Dos Ojos, Nicte Ha is very unique in its appearance with beautiful lily pads taking residence across the dabbled sunlit water. This is the place to be if you just want to float around and pretend you are in FernGully, which is exactly what I did. The Mayans sure knew how to set up civilisation. Between the beautiful beaches and Cenotes, these guys were winning. 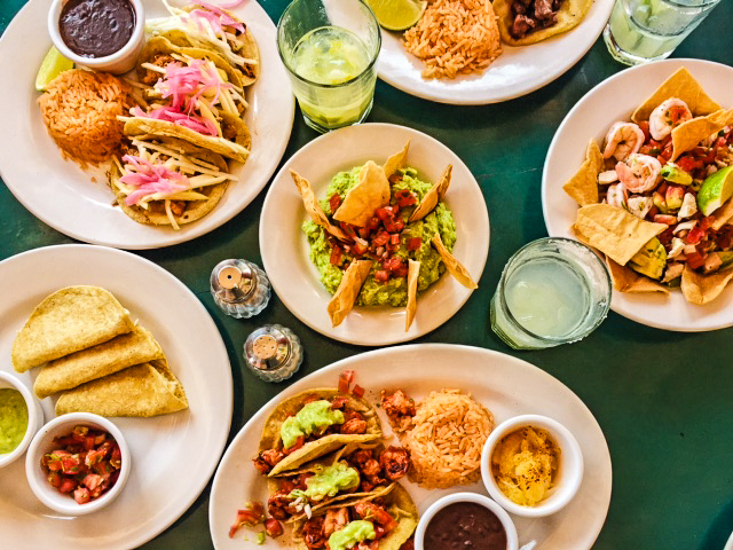 There you have it, everything you need to do, eat, see in Tulum. All there is left to do if book the ticket and grab a travel buddy.